Sukhoi is a major Russian military fighter aircraft manufacturer. Founded by Pavel Sukhoi in 1939 as the Sukhoi Design Bureau (OKB-51, design office prefix Su), it is currently known as Sukhoi Corporation. It is comprised of the JSC Sukhoi Design Bureau located in Moscow, the Novosibirsk Aviation Production Association (NAPO), the Komsomolsk-na-Amure Aviation Production Association (KnAAPO) and Irkutsk Aviation. Sukhoi is headquartered in Moscow. Finmeccanica is purchasing 25% of Sukhoi's civil division. The Russian government is planning to merge Sukhoi with Mikoyan, Ilyushin, Irkut, Tupolev, and Yakovlev as a new company named United Aircraft Corporation. Currently the Su-24, Su-25, Su-24M, Su-27, Su-30, and shipborne Su-33 aircraft are in service of the Russian Air Force and Navy. Sukhoi fighter aircraft were supplied to India, China, Poland, the Czech Republic, Slovakia, Hungary, Germany, Syria, Algeria, North Korea, Vietnam, Afghanistan, Yemen, Egypt, Libya, Iran, Angola, Ethiopia, and Peru. A total of more than 2000 Sukhoi aircraft were supplied to foreign countries on export contracts. 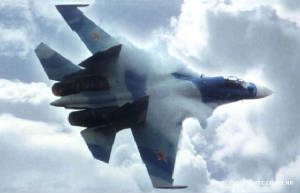 With its Su-26, Su-29 and Su-31 models Sukhoi is also one of the leading manufacturers of aerobatics aircraft. Sukhoi-Gulfstream S-21, a supersonic business jet design.